Larger-than-life panel displays invite visitors to journey alongside Owens as he grows from a sickly child of Alabama sharecroppers to a track star of international acclaim and then a hero for underprivileged youth across America. Stages of Owens’ life that are highlighted include his days in Oakville, Cleveland, Ohio State, the 1936 Olympics and after Berlin. In addition to the panel displays that educate visitors about Owens’ life, glass displays showcase rare memorabilia, adding depth to your visit to the museum. You can view replicas of Owens’ jerseys and shoes, authentic medals and trophies from Owens’ high school days as well as programs from the 1936 Olympics. Several important relationships in Owens’ life are highlighted by panel displays. These displays feature his relationship with Coach Riley, his track coach and mentor from Fairmont Junior High School as well as Luz Long, a German athlete and rival competitor at the 1936 Olympics who gave Owens pointers so he would not foul and be disqualified from the long jump. 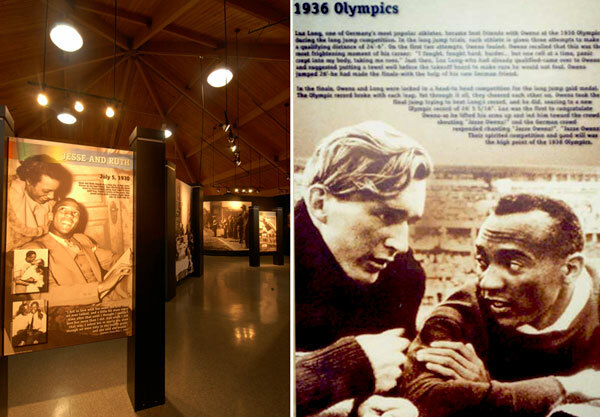 Touring the gallery will give you a sense of Owens’ humble beginnings, the obstacles he overcame to become one of America’s greatest athletes of all time and how individual excellence left a mark on not only the 1936 Olympiad but on thousands of lives that were inspired by Owens. 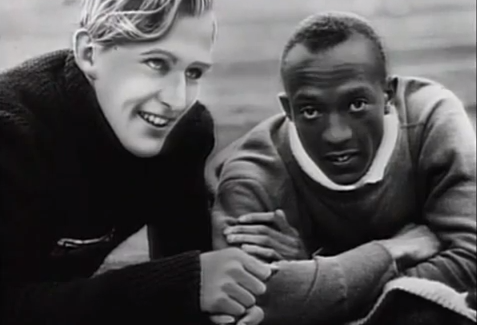 Jesse Owens with Luz Long at the Berlin Olympics. Jesse later said that what he valued the most from the 1936 Olympic experience had been his friendship with Luz Long. After his astonishing accomplishments in the 1936 Olympics, Owens began a lifetime of championing the underprivileged youth of America. His ability to elevate himself above his humble beginnings and achieve what no other Olympian had done – win four gold medals at one Olympiad – endeared him to thousands of Americans and made him an instant role model to America’s youth. Although Owens’ success came from years of hard work, dedication to his sport and depth of character, his fame afforded him the opportunity to impact so many, an opportunity that he never took lightly. As you tour the gallery, panel displays portray Owens’ dedication to making the lives of others better. Owens served as playground director for the Cleveland Park Board, director and board member of the Southside Boys Club and chairman of the Illinois State Athletic Commission. 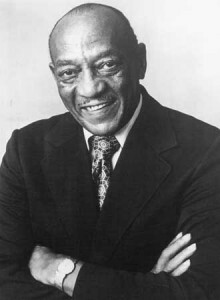 In 1955 Owens was named as America’s Ambassador of Sports by the State Department. Spreading his good will beyond his nation’s borders, Owens toured Singapore, Malaysia and the Philippines meeting with government and sports officials, and he always included time to meet with disadvantaged children.